Here's a muslin coat made up in a thin, drapey sweatshirt fleece. It's a very thin fleece but I think it does a good job as a muslin. I made the size 34 and I'll have to take it in a bit still. I did my standard petite adjustment above the bust. Here it is with a random belt. I'll need to lower the pockets about two inches. The belt goes right over them. I'll probably shorten it by a couple of inches too. I feel like I'm wearing a bathrobe. I feel like a Jedi knight with the sleeves (and color scheme) too. I'll be narrowing those a bit so they aren't so bell-shaped. On the original pattern these sleeves are gathered with elastic and kind of bell out. I received my six yards of denim in the mail yesterday. I promised you a low-down on the ho-down and here she is. Here's the link to the stretch denims . . . I love two of the fabric but dislike the third. I kept feeling it thinking, "Hmmm, this has got to have some polyester in it!" Well, I looked at the sticky label and duh it does. I should have looked closer at the online description and there in black and white it says, 80% cotton/ 19% polyester/ 1% spandex *head slap*. If only I had learned to read!! Anyway the 10oz and 12oz fabrics will work nicely for jeans. The 12oz fabric does not have much stretch to it but it will be enough to make them comfortable. I plan on washing them tonight so I'll update you on their washing/drying characteristics if there is anything weird. The 12oz denim is very rough and stiff. I think the hand will change with washings quite a bit. The 9oz is really drapey which is why I knew it was not just cotton. And the 10oz fabric is a good medium weight denim, exactly what you would expect. As for the Jeans Sew Along . . . I'll start a thread in a couple of days over at PatternReview.com. No, you do not have to have the Jalie pattern. You can use any pants/jeans pattern. We can help each other with fitting and alterations. 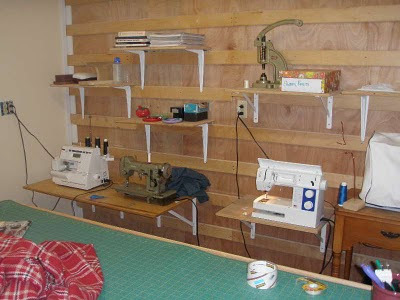 I'm slowly working on adding things to the sewing room. I have four machines set up. The white one, third from the left will need to go on a different table. It's not wide or deep enough. It'll do though until I get something else fixed up. 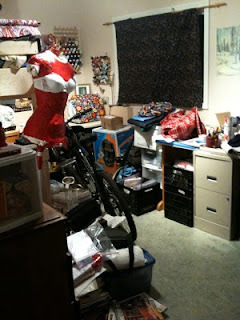 You can see my 6' by 3' cutting mat here. My wool for the wool coat is still uncut. I've been working so slowly the last two months or so. I don't know what wrong with me. Busy, busy life stuff I guess. 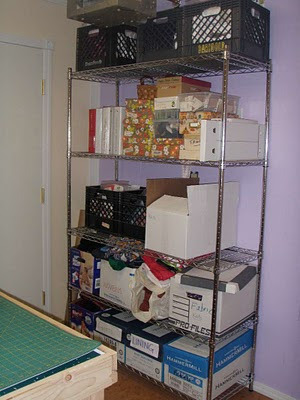 I've already filled up this shelving unit. Sheesh! Who wants to do a Spring Jeans Sew Along? There is one going on already at PatternReview. I am planning on making a few more pairs for spring and it's always fun and motivating to have company. I can always just join that one too if there isn't much interest in starting another one. Here is one reason I need a new pair. I used silk duppioni for the pockets in this Jalie pair. Well I guess I knew that duppioni shreds but, boy, does it ever. The right pocket has a small tear also but it's on the inside of the pocket. It's still usable but it will tear out just as quickly as the other one, I think. Anyway, let me know your thoughts. 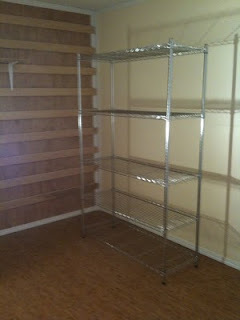 I am waiting on six yards of Fabric.com denim. As soon as I get it, I'll post a comparison of them so you have a little more information. 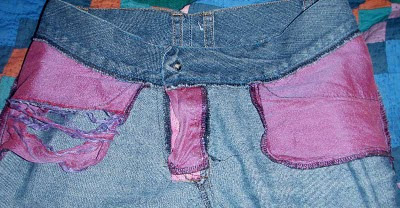 I am planning on running another Jeans Sew Along this month over at Pattern Review if people are interested. Last time, one of the big problems was finding stretch denims. Well, Debbie Cook pointed out that Fabric.com* just got in some stretch denims . I bought two yards of each of the following colors. I bought a 9oz, 10oz, and 12oz so I'm curious to see the difference in the denim. As always, I will post a full report once I get them. *Remember that Fabric.com is a sponsor of my site so it you click on one of the links and buy something, I'll get a small kick-back. If you prefer to buy but not give me a kick-back, just type Fabric.com into your browser and go to the denim section. I just back from a five day stint in Fairbanks for a family funeral. 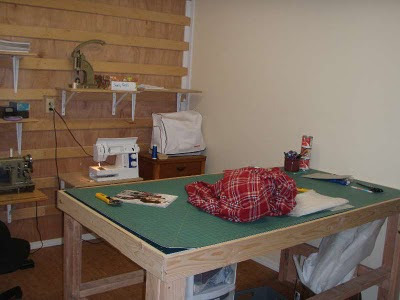 While I was gone my husband built a wall in the garage and made me a sewing room complete with faux bamboo flooring, new sewing table, metal shelf, and fun paint colors. I had no idea he was planning on this. What a surprise to come back to this. 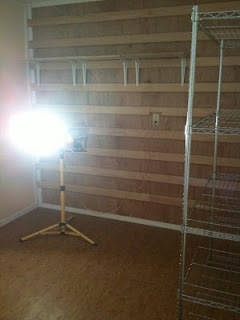 He still has to install a light and a piece of trim but he said I could start moving my stuff in. 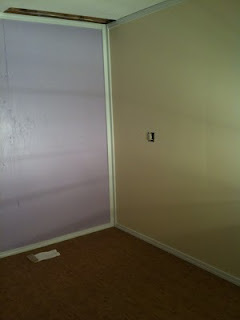 I love the paint colors. Yes, it's an ugly heater but I am in a garage. 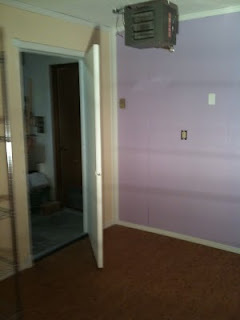 This is the current sewing room. Right now it's full of garage items. He had to move it somewhere while he worked.